I need to brag about my sisters for a moment. I look up to them in every way! They are the most crafty, loving, creative, best sisters ever! The other day I called Cheryce and asked how her day went. It turned out that she had just cleaned her entire basement, grinded wheat, made homemade bread with that wheat, made salsa all the while running around her four girls. I don't know how she keeps up with everything but she makes it look easy. As far as Alysia goes, she is AMAZING. She always has the cutest ideas for everything, so talented and thoughtful. Everything she does is adorable. I steal all my recipes from her. 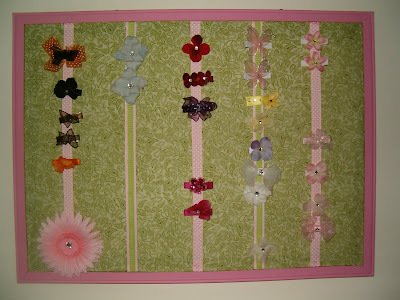 We made these bow holders last week and they turned out really cute. They both are great mothers and my best friends. I love you guys! Aww, that is so sweet! You guys are all really talented and creative and beautiful! i LOVE this blog rachelle. Awww, I am glad I read that one!! You know I love you too! BFFS forever!! You know you're right up there with them, girl! You guys make me SICK! (trying not to cry) Thanks shell, right back at ya! this is one of the number one reason why we had to move back to utah, just so I could hang out with you more! Sisters are the best! You guys are all darling, and I love the bow holder. Cute idea.